Since I still get mails every now and then or find videos about it on YouTube or DailyMotion (I was quite honored), I decided to put up Bombs And Bugs here as well. 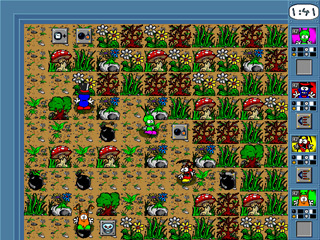 Bombs And Bugs is a Bomberman clone I did for the Atari ST back around 1993 I think with some help of a friend creating the graphics. Nobody but my friends and me played it 🙂 In 1997 I ported it to DOS and released it as shareware under the moniker AWKWARD Software. Then two friends helped me and created the hand-drawn graphics, original music and sound effects for version 3.0 and I ported it to windows. This verison was actually released in boxed form in a Windows game collection and as a single title in a jewel case. 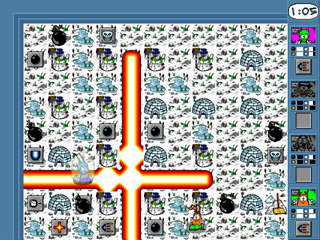 Since I never played the original Bomberman until much later (I just liked the idea so much that I wanted to play it with my friends and made it myself) there is one major difference in Bombs And Bugs gameplay: The default bombs in Bomberman are stopped by a piece of wall (so you are safe behind it), in Bombs And Bugs, a bomb always destroys everything within its range. 2.2: Runs under DOS, with 320×240 resolution and the fields are more rectangle than square. But some people prefer this version to the newer ones. 3.0: Latest DOS version with hand-drawn comic graphics (now in amazing 640×480) and original sound and music. 3.1: Windows version of 3.0. The DOS versions run pretty good with DOSBox and there are some instructions included how to get them started. The Windows version was for Windows 98 (for the younger people around here: no, that’s not 90 versions into the future, it’s from 1998 ;-)) and does not run very good on a modern Windows. You can play around with the compatibility options (right click on bugs.exe -> Compatibility), but I myself had not any luck to get in running properly under Windows 7. DO THIS AT YOUR OWN RISK, I AM NOT RESPONSIBLE FOR CRASHING YOUR COMPUTER WHEN PLAYING AROUND WITH A 15 YEAR OLD GAME! And maybe I make a modern Windows version or an Ouya version. What do you think? Using the old graphics or new graphics? Just write something in the comments. Thanks for playing all these years and have fun!